Special Containment Procedures: SCP-1353 are to be kept in the same room, but stored separately in sealed plastic tubs. Tubs are to be labeled in accordance with each instance. SCP-1353 instances are to be handled only while wearing full-body protective wear. Individuals may only interact with one another for purposes of experimentation. SCP-1353-A are to be kept in standard humanoid containment chambers. They are to be denied access to any toys, music, books and other recreational items older than 12 calendar months unless in controlled lab circumstances but are to be otherwise treated as a normal human in containment. SCP-1353-A are permitted access to psychiatric medication upon request in order to mitigate emotional response. They also must keep a daily record of their awareness of SCP-1353 in a journal. These records should be added to Document-1353-01 on a weekly basis. Should the SCP-1353-A population exceed more than 5, the oldest and least healthy are to be culled and remains cremated immediately after culling. There is to be no skin contact with SCP-1353 or SCP-1353-A instances without permission of level 4 or higher personnel. 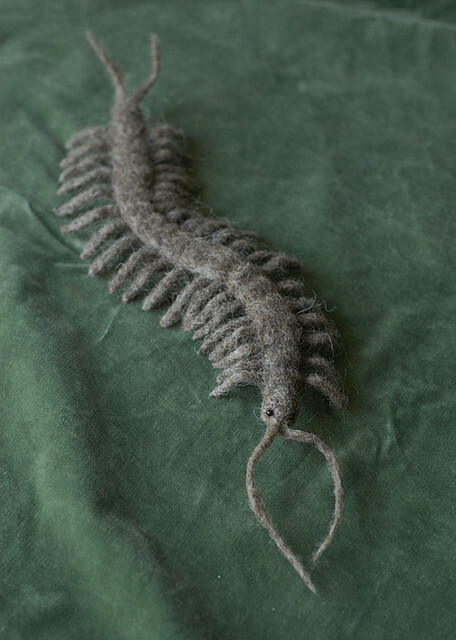 Description: SCP-1353 is a given label to a group of animate needle-felted sculptures closely resembling members of the class Chilopoda (centipedes). Instances of SCP-1353 vary in color and size, typically bearing at least twenty pairs of legs and a pair of functional eyes. Typically, adults can range from 30 to 50 centimeters in length and are on average 2 centimeters in width. SCP-1353 is capable of breeding, but only adult instances are able to create SCP-1353-A. Specimens have been typically found in urban environments, with exceptions as a result of interaction with trucks and other human transportation. SCP-1353 displays nocturnal behavior and will actively seek out sleeping humans to turn into SCP-1353-A via dermal exposure. Once contact is made, a specimen will use its forcipules to create an incision and enter the human. These forcipules generate a venom that works as a local anesthetic and thus the incisions will usually go unnoticed until the specimen has thoroughly embedded itself under the skin. Once embedded, the specimen will continue to move underneath the skin but will not cause tissue damage; it is hypothesized that SCP-1353 is capable of creating a minor spatial anomaly to achieve this effect. Approximately 1 week after embedding, SCP-1353 will no longer be seen underneath the skin and is assumed to enter a dormant state inside of the host's abdominal cavity. Humans hosting an SCP-1353 instance are collectively referred to as SCP-1353-A. SCP-1353-A report being aware of hosting SCP-1353 instances but do not usually report pain apart from injuries caused by initial entry. Hosts continue to function as normal human beings, with the only exception being when presented with any stimulation that invokes feelings of nostalgia. If SCP-1353-A experience nostalgia of any kind, the hosted SCP-1353 instance will re-activate and continue its movements at random inside the body. This re-activation time has been reported to last at least 15 minutes and at most 5 hours. SCP-1353-A are acutely aware of the presence and movement of their hosted SCP-1353; they will express moderate to extreme discomfort at the re-activation. SCP-1353-A are known to react violently to nostalgia as a result of this, but may eventually adapt to deprive themselves of the emotion. Addendum-04/25/20██: An outbreak of SCP-1353-A was reported to Foundation personnel in the city of Austin, Texas, United States of America. Investigation into the outbreak uncovered the source of a population of SCP-1353, currently theorized to have been purposefully planted. A single metal box was found as the source of the assumed planted population, containing the following note. Inquiry into potential suspects are currently ongoing. congratuLations you found my box, friend! and they will gladly hUg you from the inSide! Addendum-1353-A-19: The following is a personal log from SCP-1353-A-19, a 47-year-old female of African American descent. SCP-1353-A-19 reports to have been host to its SCP-1353 instance for the past ██ years, despite having only been under Foundation custody for the past █. I used to try and tough out the feeling. I thought that I could get used to it. It's like a cat in your lap with its claws dug in until there are little pricks all in your stomach and legs, and then it climbs in and you feel its fur rubbing against the wrong side of your skin. Every leg taps alongside each other and you can feel every thread as it pushes itself a little tunnel inside you. Why did this happen to me? I just woke up thinking about some man with kind eyes I saw down the street the day before, how he touched my arm and said he was sorry before walking off. Same place that morning I felt it on me. I could see the little bumps of its segments as bulges in my skin as it pushed itself up my shoulder and watched it climb down my back in the mirror. It went into my belly and then it made itself at home in me. And now, every time I'm reminded, it reminds me that it's still there. I can feel its little felty legs. Sometimes it crawls upside down inside me, so I feel the legs instead of the fur on the wrong side of my skin. Most of the time though, whenever I'm reminded, I can feel it rubbing and crawling along my intestines. Every thread, antennae, even the little bulge of its eyes. Today I felt it crawl up inside my neck, back against my trachea and legs against the artery. It shimmied up to the back of my neck and started shuffling against my skull. The skin was really stretched up there and I figured it might've gotten stuck once or twice. Really though the worst part was that I could kind of hear it when it circled near one of my temples. It sounded like really quiet brushing or swishing against the bone as it crept along. I think its fangs scraped a little, too. You never get used to it. You just learn to avoid what makes it go.